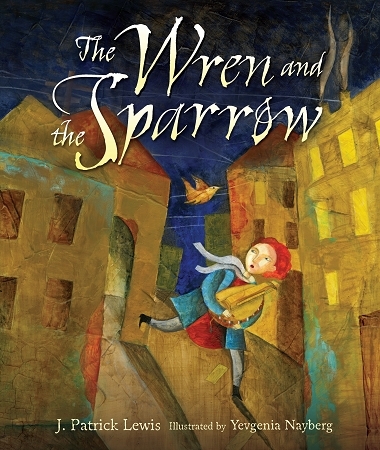 An old man, known as the Wren, plays his hurdy-gurdy, and with the help of his student, the Sparrow, brings hope and inspiration to the people of a small Polish town during the Holocaust in The Wren and the Sparrow. When the Nazis come to take the town s musical instruments, the Wren asks for one last song. When his hurdy-gurdy is taken, it is up to the Sparrow to save it and ensure that the day is remembered forever. This beautifully illustrated fable by U.S. Children's Poet Laureate (2011-2013) J. Patrick Lewis weaves a lyrical and elegant tale of a mysterious musician and the trusted young friend who rescues the hurdy-gurdy and hides it from its intended fate at the hands of the Nazis. The richly colored illustrations are by award-winning Russian painter and stage designer Yevgenia Nayberg. Includes an Afterword with history of the Lodz Ghetto street musicians who inspired this story. "A beautiful tale emphasizing the importance of music - especially during times of despair"
"Nayberg's stylized brush strokes initially take tones of brown and drear, but they warm with hope toward the end. The textured creases and cracks of paint echo the deliberate folds of the letter that holds such importance. A lyrical look at a horrific time; an appeal to the necessity of remembering." "Lewis (Harlem Hellfighters), the former U.S. Children's Poet Laureate, writes in elevated, allusive, but always approachable language: 'A six-year-old's only possession, ten finger cymbals, tinkled like the sound of spring escaping winter.' Nayberg's solemn, stylized images portray people who are exhausted and terrorized (several images are genuinely frightening) but holding onto hope."